Marcius Galan, Section (prisma fumê), 2012. 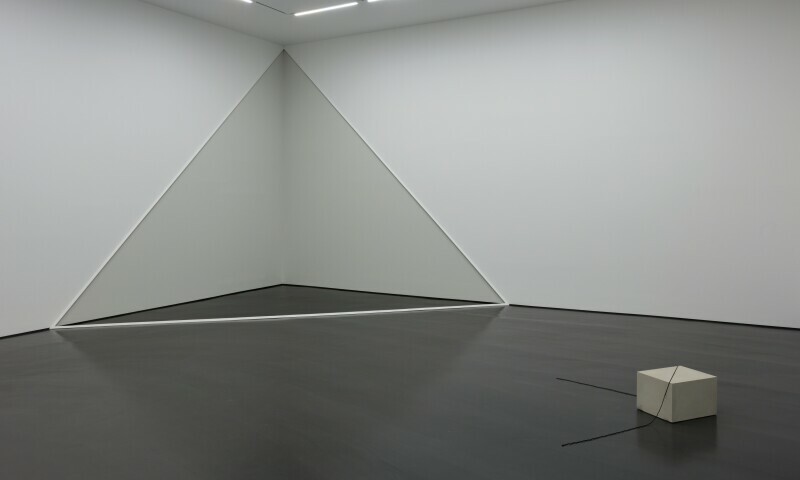 Floor wax, wood and paint on wall, variable dimensions. The work Seção (prisma fumê) [Section (Smoked Prism)], 2012, by Marcius Galan, which is part of a series of works in which the artist creates optical illusions through interventions in the physical environment with lines drawn in the space, combined in a chromatic interplay with the use of light as a pictorial element. The work, which was acquired by the Patronos da Arte Contemporânea [Contemporary Art Patrons] Program of Acquisions of the Pinacoteca do Estado de São Paulo, carries a certain visual complexity, establishing an ambiguous and unstable space that prompts the spectator to perform a careful inspection. Born in 1972 in the United States and based in Brazil, Galan works in a variety of different media, including sculpture, installation art, photography, collage and drawing. He has participated in major national and international exhibitions such as Art and Space, Guggenheim (Bilbao) in 2017 and the 30th Bienal de São Paulo. In 2011 he was awarded the Cisneros Fontanals Comission Prize, and won Prêmio PIPA in 2012, which led him to participate in a renowned artistic residency at Gasworks, in London.